Here is a very long article on the legacy of the mayoral takeover of DC public schools back in 2007, which brought in Chancellors Rhee and Henderson, among other things. Having been a teacher, a mentor, and a volunteer in and visiting DC public schools for that period of time, I’m not particularly impressed with the changes I’ve seen. The article, which I still haven’t finished reading, has criticism of what hasn’t worked, by Mary Levy and John Merrow, and also features a reply by Thomas Toch (who is very much a cheerleader for the “reforms”). Here’s the link. Please read the article and comment, and take some action as well. Very detailed article in the Washington City Paper showing how our recently-resigned Chancellor, Kaya Henderson, failed to do much of anything to narrow DC’s extremely-high gap between high-achieving and low-achieving students, even though she had oodles of money, complete control over resources, and the ability to fire teachers and administrators almost at will. As I have shown repeatedly (see here, here, here, here, and here for starters. Or else here) DC has the widest gap of the entire USA between the scores of poor kids vs the non-poor, between white kids and black or hispanic kids, and between those in Special Ed and those who are not. This article shows how the Henderson and Rhee administrations failed to do pretty much anything to improve conditions at schools where there were large concentrations of ‘at risk’ kids, other than saying that by some miracle, they would improve scores by 40 percentage points at all of the schools where 40% of the kids were ‘at risk’. And of course, it never happened. No extra resources, and no miraculous gains. My friends and colleagues Elizabeth Davis and Mary Levy are quoted. It’s a long article, but well worth reading. Enrollment in DCPS – Have Rhee & Henderson Saved It? Michelle Rhee, her acolyte Kaya Henderson, and all their supporters keep saying that their corporate-style educational deforms in Washington DC have done wonderful things, such as increasing the enrollment in DC public schools. As usual, they are not telling the truth. To compare apples to apples, and not watermelons to peanuts, it pays to look at the same sort of data every year — in other words, let’s look at just K-12 enrollment for as far back as we have data. I converted some of her data into graphs so you can see it more easily. I present first the total enrollment for grades K-12 during that time period. Tell me where you see a large uptick since 2007, because I for one can’t find it. It seems to have stabilized, but that’s all; and this at a time when the entire population of the District of Columbia grew by about one-fifth (about 100,000 people) and the enrollment in our publicly-funded, but privately-run charter schools has gone through the roof. So, not exactly a stellar job; in fact, the sort of job that ought to get Henderson and company fired for sheer incompetence. 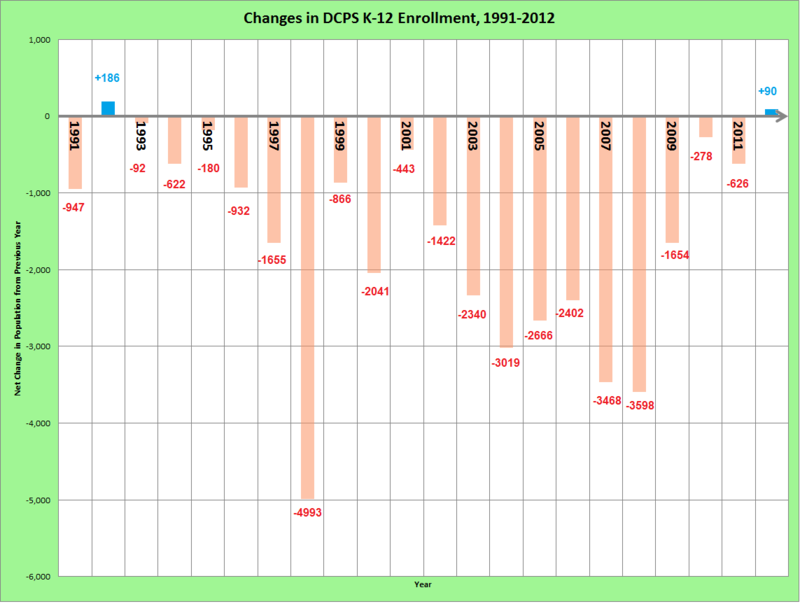 In fact, this is not the only time that DCPS enrollment was roughly stable – that also happened from 1990 to 1996. My next chart shows the actual year-to-year changes in DCPS K-12 population. A red bar pointing down means that the schools had fewer students that year than they did the year before. A blue bar pointing up shows an increase in students over the previous year. There was a tiny increase in the fall of 2012 (the current school year), just like there was a tiny increase in the fall of 1992. 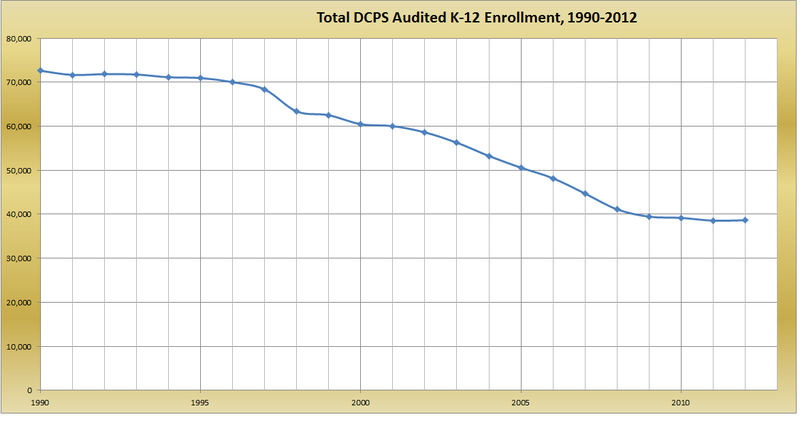 The largest drop occurred in 1998, when DCPS had a net loss of about 5000 students from the year before. It is madness to pretend that things have been hunky-dory since Rhee and her inexperienced, arrogant, highly-paid management types and consultants arrived in 2007. In point of fact, what they did is trash the few decent things in DCPS with their own corporate style of autocratic foolishness and hubris. They have fixed exactly none of the problems that parents, teachers and students were complaining about, and they hide any real data like this. It is time to throw them out and go back to a democratically-elected school board and neighborhood schools — to begin with. Yes, lots of changes need to be made, but this crew has not a clue.